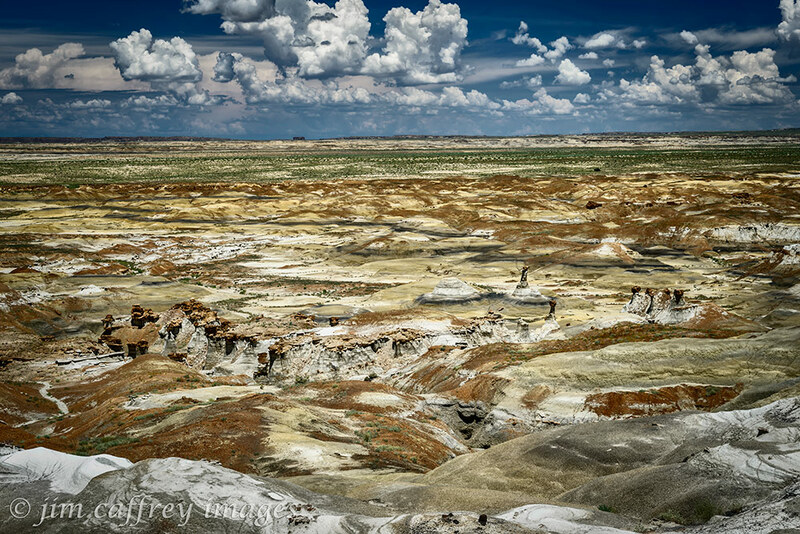 The plan was to explore a small badlands on the Navajo Reservation. It is close to the settlement of Burnham, which is about half way between New Mexico Rte. 371 and US 491. 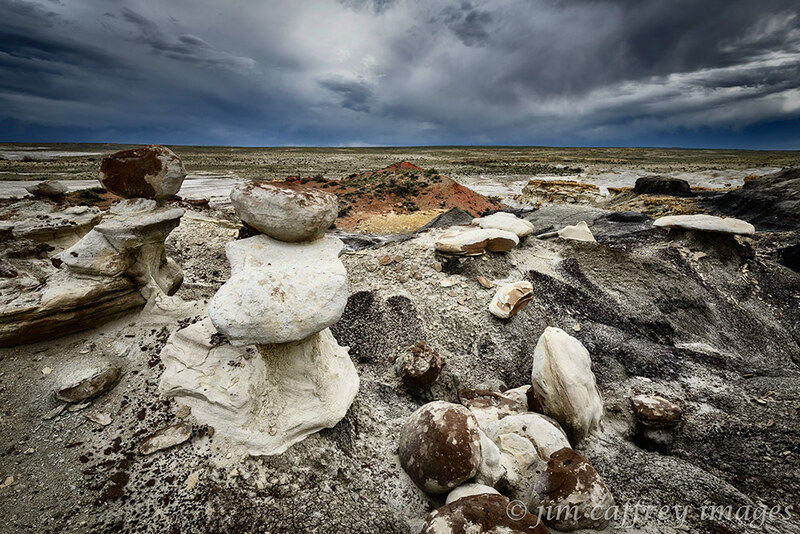 I packed up the car early on July 4th and headed into the expanse of the San Juan Basin. I have been wanting to make the drive across route 5 for some time, but I always put it off. The first half of the drive is unremarkable: a straight track across high desert grassland. As the road drops off the plateau, however things begin to get more interesting; the view opens up and you can see across the lowlands clear to the Chuska Mountains along the Arizona border. There are several volcanic plugs visible, including Shiprock on the distant northwest horizon. 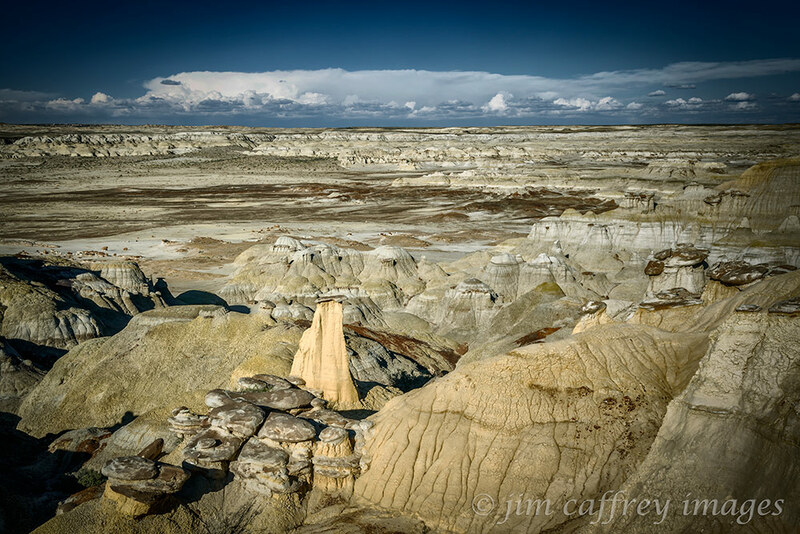 These first two images show the landscape looking across the badlands from the top. 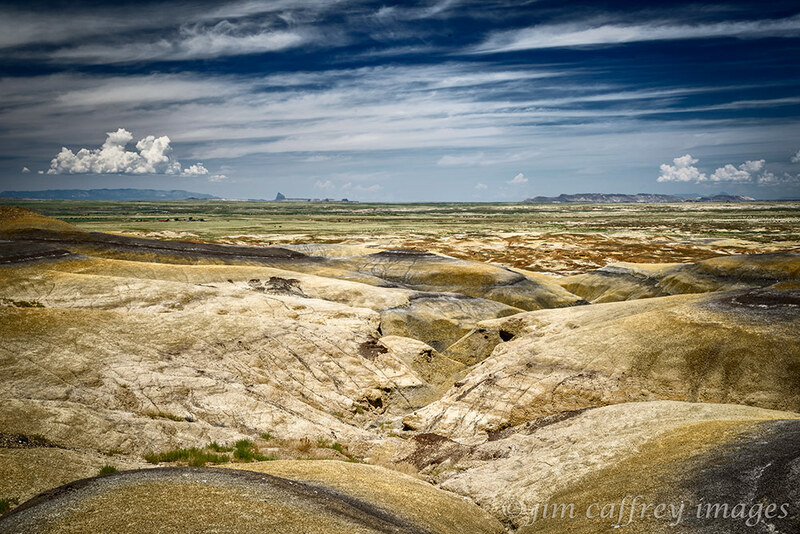 One shows Shiprock in the distance, and the other is a view of the main part of the badlands area. 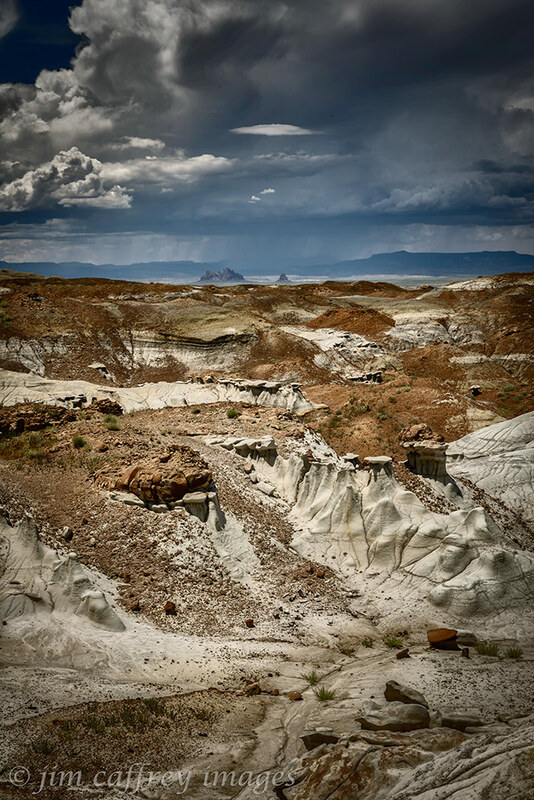 The route to the bottom is gained by finding a trail across the bentonite hills and between the numerous small washes that drain the uplands. This is where a good GPS system was invaluable, The “breadcrumb” feature made it relatively easy to follow the path back to my car. 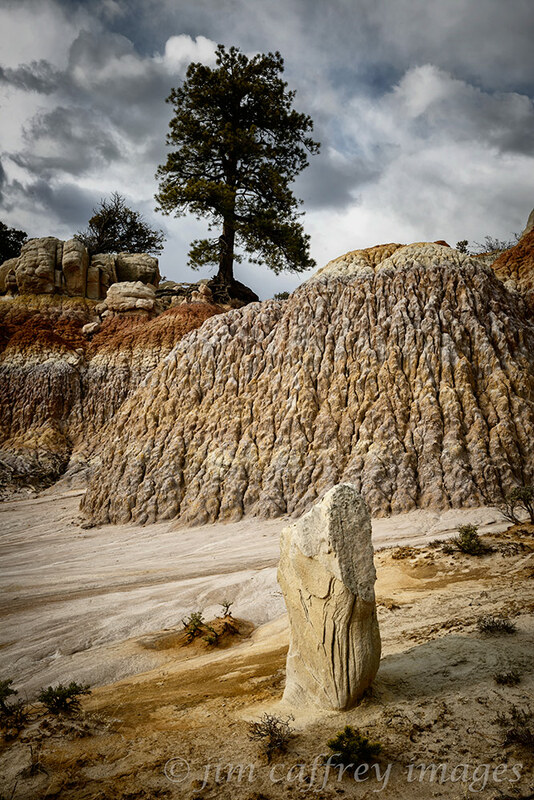 When I reached the bottom, I made my way to the most prominent feature, a tall gracefully eroded hoodoo atop a small mound. The colors are mostly yellows, blacks, and reds, the subtle gradients made an interesting compositional element, as did the small boulders strewn across the floor of the wash. I had heard about a petrified stump somewhere in the area and I set out to locate it. I started by skirting the margins of the flats, moving in and out of each small drainage. I really had no point of reference, but since these badlands are relatively small, I felt confident that, if I kept looking, I would find the stump. I stopped to make a photo near the southern edge of the main wash and as I turned around to continue my search, I saw what I was looking for on the opposite side of a low outcropping. What I found most interesting about this particular piece was the nearly intact root extending down as if it was still doing its job of delivering water to the tree; such a commonplace relationship frozen in time and space. I continued exploring for the next couple hours and found more petrified logs and small hoodoo groupings before making my way back to the car. 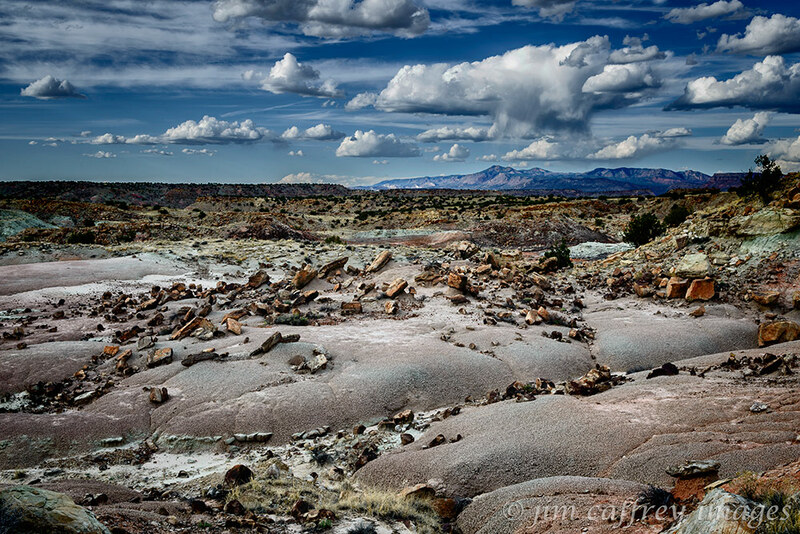 As I began the climb back to the top, I made a photo across one of the tributary washes to the jumble of bentonite mounds that surround the lowlands. As I continued the climb out, I made several more images, including the one below, looking westward to the Chuska Mountains. I was thankful for my GPS, I had to reference the “breadcrumb” feature a couple times to find my way out of the maze. When I reached the car, I realized that it was still relatively early in the day. Looking out over the landscape, I once again saw Shiprock on the horizon and decided to drive there to photograph it at sunset, hoping for some nice color in the overcast sky. I returned to IR-5 and continued west to its junction with US 491 and then headed north to my destination. Shiprock glows as the sun gets low in the west. I drove onto the dirt road just east of the lava dike and followed it for a couple miles until I found a good spot and began the wait; there was still a couple hours to go before sunset. I set up my camera and tripod, made a few exposures, and repositioned the setup. I then settled in to wait for the anticipated light show. I made exposures whenever the light was interesting, and read a book I had brought along to help pass the time. In the end, sunset was not what I had hoped it would be, the clouds grew more dense obliterating the evening light and muting what little color there was. But, I had plenty of images with some nice light to choose from. 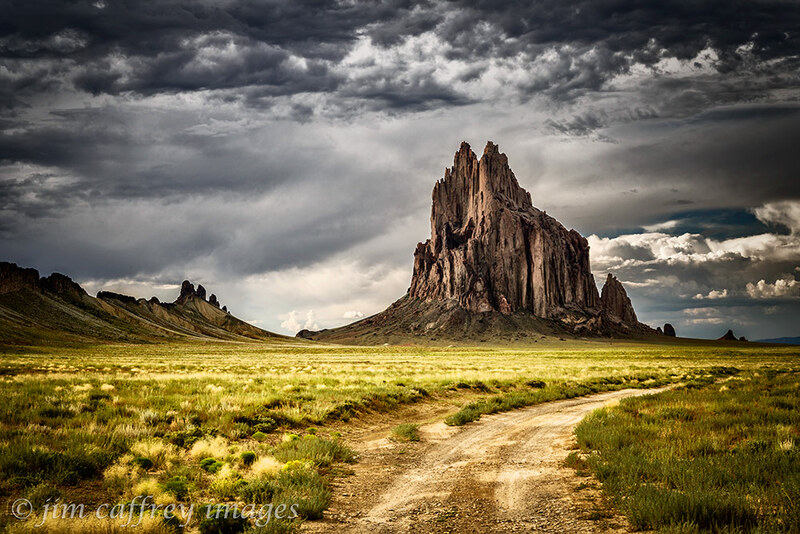 This is my pick out of those, the side-lighting does a nice job of revealing the rugged texture of Shiprock, and also casts a nice glow across the foreground. I drove to Farmington to spend the night satisfied that I had come away with some good images. I decided that I would extend the trip through the next day and see where the wind would take me. 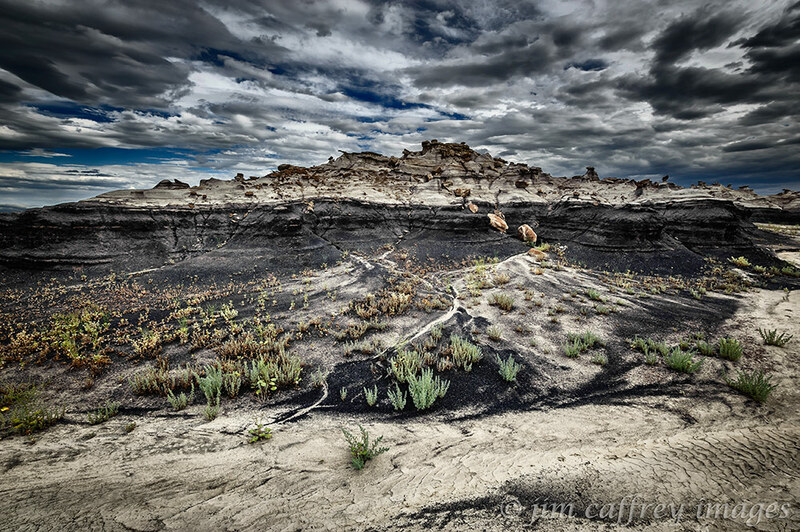 I spend a lot of time in the desert, more specifically, in the badlands of the San Juan Basin. 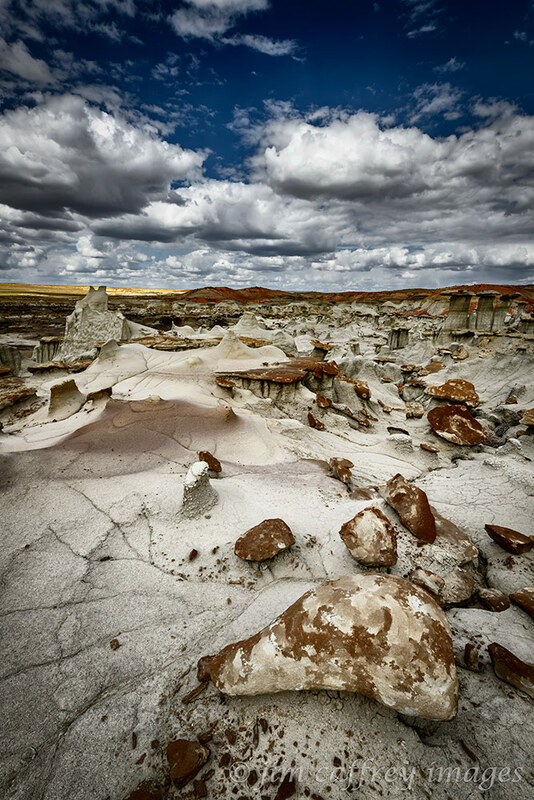 And, of the nine recognized badlands located there, I usually find myself wandering in either the Bisti Wilderness, or Ah Shi Sle Pah Wash. But, I want to step out of the box here and give a nod to the rest: the Ojito Wilderness, Mesa de Cuba, San Jose, Lybrook, Mesa Penistaja, Ceja Pelon, and De Na Zin. 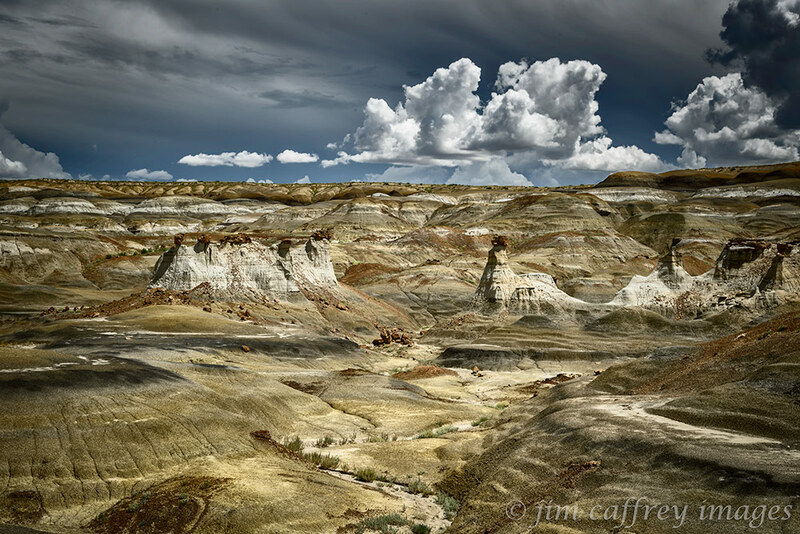 What exactly is a badland? Merriam-Webster defines it as: a region marked by intricate erosional sculpturing, scanty vegetation, and fantastically formed hills–usually used in plural. 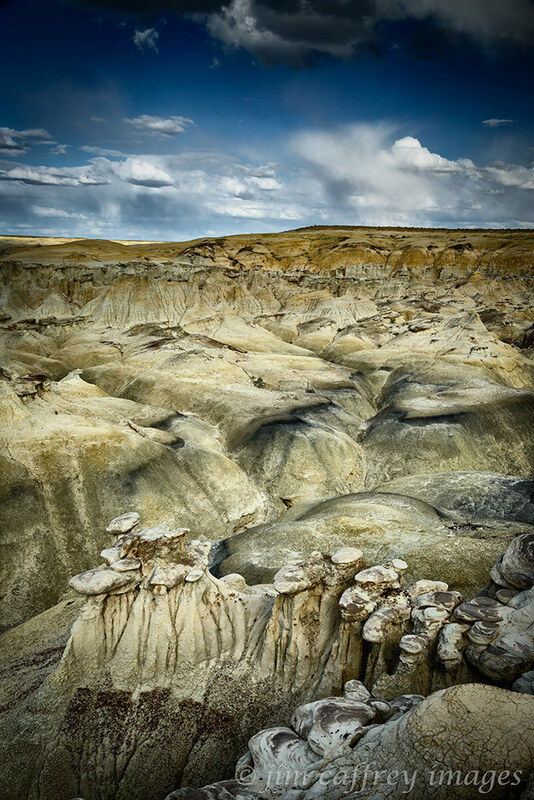 The pre-requisites for a badlands to form are a grouping of harder sedimentary deposits: sandstone, siltstone etc. suspended in a softer matrix. As the softer material is eroded away, the harder, more dense material is left exposed, often perched on pedestals of the soft matrix. 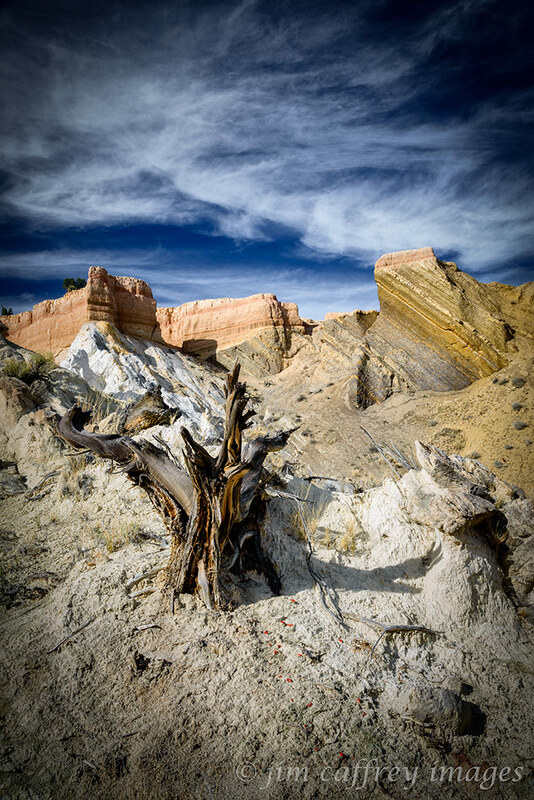 Multi-colored bands and interesting textures abound in this small section of the San Jose Badlands. 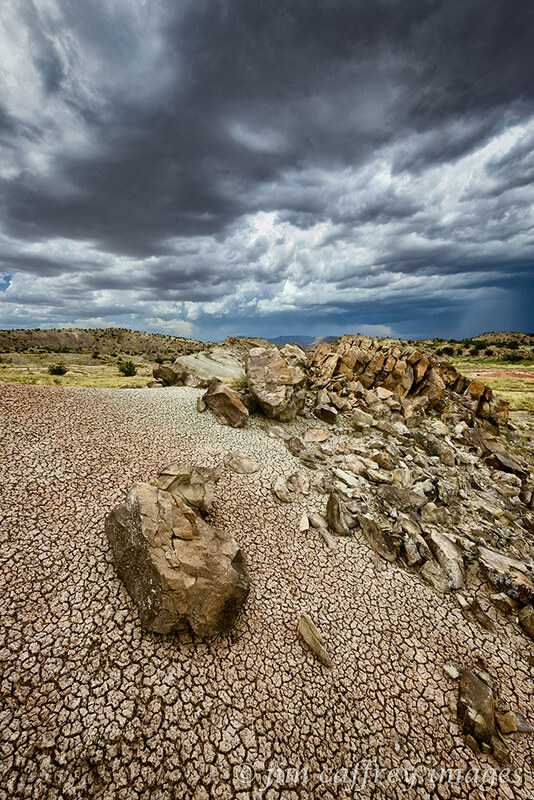 But, at times the harder deposits may just be scattered haphazardly across a playa or alluvial plain or they may be isolated and in unexpected angles of repose. 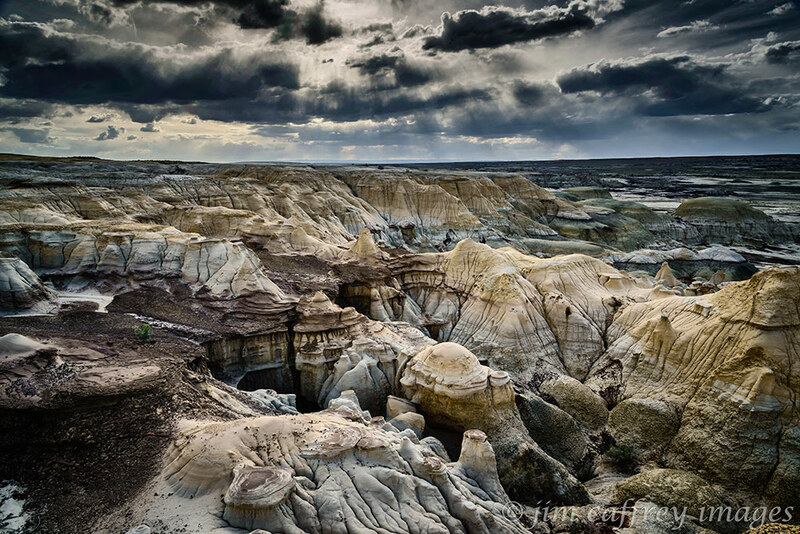 The seemingly inexplicable arrangement of the features is part of the mystique of the badlands. How did they get here and why? The answer to that question could fill a Geology text, and I am not even remotely qualified to go there. I can say, with some authority however, that the photographic possibilities are as close to infinite that you can get. As you can imagine, the creation of such an environment takes time…a lot of time. Mesa de Cuba, the youngest is 38-54 million years old. 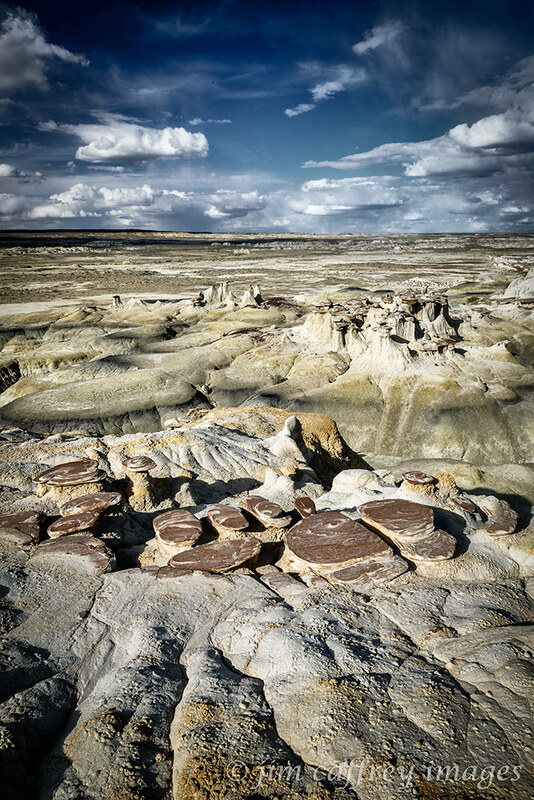 San Jose is 48-64 million years old, Lybrook, Ceja Pelon, and Penistaja are all 60-64 million years old, De Na Zin, along with Bisti and Ah Shi Sle Pah, is 70-75 million years old, and Ojito is the oldest at 144-150 million years old. Each of the aforementioned locations have their own personality, and each of them offer there own version of timeless beauty. 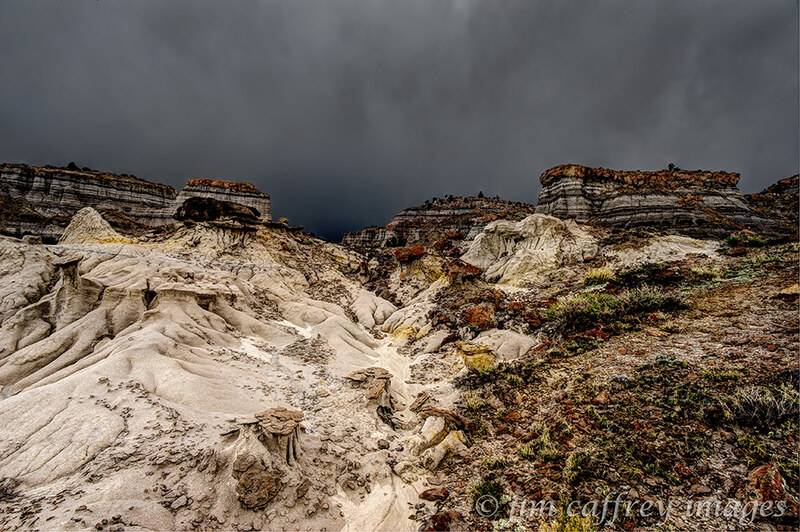 Color is an element that often takes center stage in the badlands. Depending on the mineral content of the soil, there may be layers of red, yellow, blue, or even green. 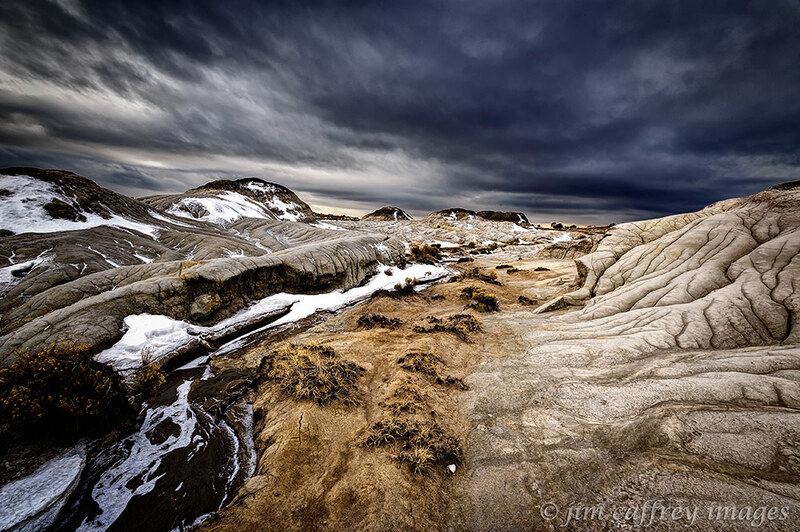 Combine this palette with the other strange and, often, unexpected elements of the landscape and the other-worldly, remote locations become even more surreal. A closer look at sedimentary rock on bentonite in the Ojito Wilderness. 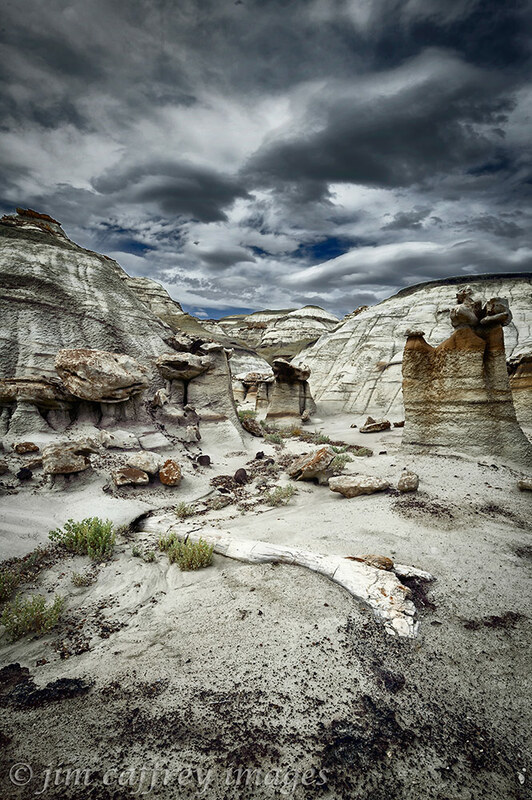 Possibly the most noticeable feature of such environments are the many erosion channels and drying cracks that cut into the soft bentonite, and mudstone that form the matrices that support the entire system. When the light is right, they stand out in stark relief revealing an almost unimaginable complexity. 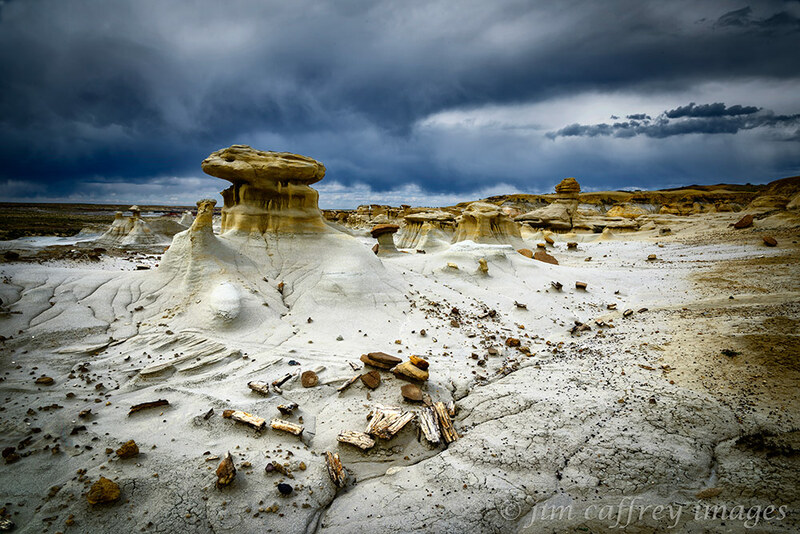 As I already pointed out, most of these locations are much smaller than their more famous big brothers: Bisti, and Ah Shi Sle Pah. But, what they lack in size, they make up for in their diversity and surreal beauty. 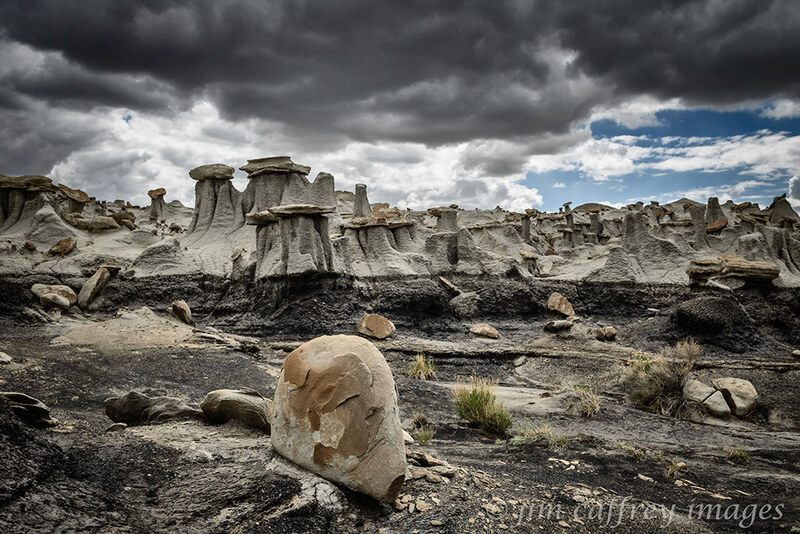 When you add to that the knowledge that these environments have been so many eons in the making (that petrified log emerging from the side of that bentonite mound was a cypress tree in a Mesozoic swamp), and are ever evolving (those sandstone slabs you just walked over will be the caprocks of hoodoos in some distant, future landscape), exploring and photographing them becomes even more significant and mysterious. Just as you can never step into the same river twice; because of their fragile, and ever-changing nature, you can never visit the same badlands twice.